Projected sea level rise by the end of the century could threaten 90 percent of coastal freshwater turtles, according to a study published on Monday in the journal Biological Reviews. The study, conducted by researchers at UC Davis, marks the first in-depth assessment of how sea level rise could affect habitats for freshwater turtle species. About three-quarters of the world's freshwater turtles live near coastlines that are expected to experience a sea rise of 3 feet by 2011. Of those species, fewer than half are known to sometimes tolerate a slightly saltier environment. “We don’t yet know whether these turtles can adapt or shift fast enough to move with the changing salinity,” says lead author Mickey Agha, a UC Davis graduate student. 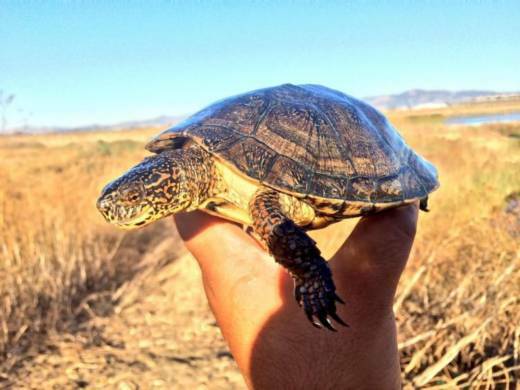 Researchers have been studying western pond turtles, California’s only native freshwater turtle species. Classified as a species of "special concern" by the California Department of Fish and Wildlife, their populations have significantly dwindled, due in part to habitat loss caused by development, says the report. The study found that western pond turtles face "a triple threat" of sea level rise, drought and water diversions, all of which result in saltier habitats. High levels of salty water can cause some freshwater turtles to lose body mass and die. Turtles have been on Earth for tens of millions of years, and most species are freshwater turtles. Only about 20 percent of turtles live in the sea or strictly on land. While more research is needed to see how freshwater turtles will adapt to their changing environment, the biologists say their findings should raise alarm bells. “This is a species that is slow to evolve," says Brian Todd, senior author and associate professor at the UC Davis department. "If we rely on natural selection to sustain them, they will likely disappear."